There is a major problem with business intelligence for most CEO's. For most chief executive officers, it's easier to know what's going on outside the company and in the market than it is to know what's really going on inside the organization (like how many productive employees do we have and what's our cash balance today). Research Aberdeen conducted back in December 2011 found that 65% of managers faced a shrinking decision window. They were under pressure to react faster than ever as business events occurred. Business intelligence - or analytics - can help to get information into the hands of managers that need it. Over a quarter (28%) of organizations that took part in Aberdeen's research into agile business intelligence needed to provide information about business events to managers within one hour of those events occurring, in order for them to make timely management decisions. But, what are the best practices that enable some companies to deliver operational analytics cost effectively while others struggle? Months, weeks or days are no longer acceptable time scales for delivering information to the business to facilitate real-time decision making. You need to see and analyze operational information needed to make decisions whenever and wherever they are and the information needs to be fresh. As an example, most manufacturers are not leveraging their own internal data to their best competitive advantage. In fact, these organizations often have valuable data scattered throughout their enterprises without a proven mechanism to find, track and recover exact components of data in real-time – necessary for making more intelligent decisions on-the-fly as well as keeping abreast of competitors, sales forecasts, inventory changes and market trends. As stated before, it is faster to find information external of the business than within. Moving to the next-generation ERP technology will give companies a boost from new advances in analytics and business intelligence solutions that will give manufacturers the ability to rapidly uncover the right data sets while providing intelligence on how to act on that data based on the situation at hand. SYSPRO ERP is one way to change the paradigms for how to collect analytics. SYSPRO Analytics bring all your important data — HR, sales, finance, operations — together in one place and it's designed for actual business executives. SYSPRO Analytics lets you take action with the data by collaborating with co-workers, setting up intelligent alerts and viewing the information on your dashboard. 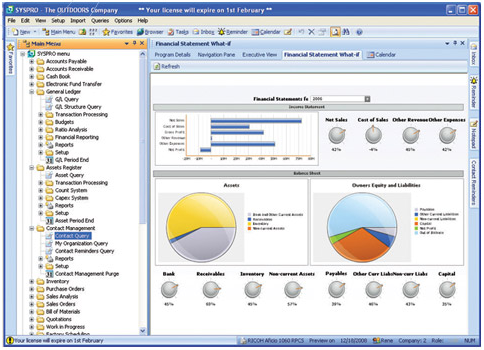 Real-Time Executive Dashboards you will see in a SYSPRO demo. Call us at 1-800-742-4868 or click here to schedule a SYSPRO demonstration to learn how you can take advantage of real time analytics.